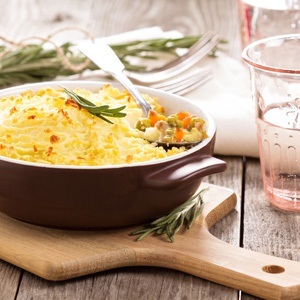 It is a very quick and tasty comfort food dish that will delight and please the pallet. Any and all who are served it will be left wanting more. 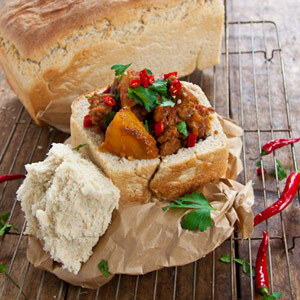 The Klutz in the Kitchen highly recommends it, so tuck into this quick and delicious bunny chow. Chop the rosemary roughly and mix with the lemon juice and olive oil. Preheat oven to 120° C.
Season the steaks and cover with the olive oil mixture. Leave for about 10 minutes or longer if you can. Heat a large frying, add some vegetable oil and cook the onion until soft. Add the garlic and cook for a further minute. Add the steak and sear (tossing all the time) for a minute and then add the tomatoes and finely chopped basil. Simmer for about 5 minutes. Season to taste. Place the rolls in the oven to warm for about 10 minutes. Cut the tops off the warm rolls, fill with the steak and tomato mixture. For some extra sass, serve with some Mrs Balls hot chutney.